Woo! And one more more MIPCOM entry. Bat Pat is a production of Atlantyca Entertainment in Italy. 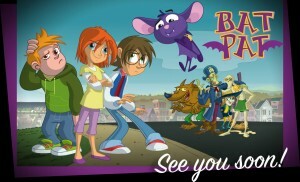 According to Animation Magazine, “The 2D series follows the spooky and comical adventures of a talking bat, Bat Pat, and the [human] Silver siblings… as they unravel mysteries and cross paths with supernatural creatures of the night in the quirky town of Fogville.” According to Atlantyca, “Bat Pat grew up in a dark library in a different town, so he has an encyclopedic knowledge of the various creatures of the night. Bat Pat is like a kid full of wide-eyed wonder, he truly appreciates the little thing daytime offer but nighttime is where Bat Pat really thrives. Despite his initial fears, he’s equally driven to help supernatural creatures in need because Bat Pat shares a common link with them…they’re both creatures of the night and usually misunderstood by ‘normal’ people! Bat Pat is very loyal to the kids and they love him, they consider Bat Pat ‘the flying Silver’.” The show is based on the popular series of young reader books by Roberto Pavanello. Atlantyca has a production web site for the show that includes lots of background notes and a video trailer. And one more from MIPCOM. (Wow, they had a lot of funny animal TV series being plugged this year!). 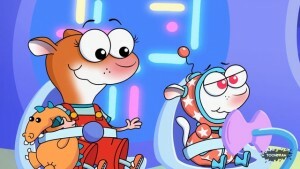 YaYa & Zouk are a pair of little funny animal whatsits in this 2D series for very young viewers, created by Dominique Jolin and produced by ToonDraw Productions in Canada. “Between an active mom, a curious baby, and funny stuffed animals, a big sister named YaYa and her young brother, Zouk, have fun moving back and forth between reality and zany imaginary worlds. Whether it’s through a mirror, borrowing a spaceship, or simply diving into the forest located at the back of the closet, YaYa and Zouk live the pleasure of being two, and being together.” There’s an interactive web site for the series that tells you more about it. Oh, while you’re at it check out ToonDraw’s web site too — they’ve got a new series called Animal Talk in development. It’s about an animal reality show — and we plan to keep our eyes on this one! Another MIPCOM find, courtesy of Animation Magazine, called Welcome to Bric-A-Broc. “Mino is a lively city cat: cheerful, crafty and very boisterous. In the hope of calming him down, his parents have sent him to a countryside holiday camp for the summer. Mino can’t think of anything worse! He’s stuck in the middle of nowhere on a dilapidated farm run by an old goat and a scatter-brained giraffe. The manager is a stickler for rules and the instructor keeps organizing loads of outdoor activities to make the most of the fresh air when all Mino wants to do is stay inside where it’s warm and cosy and play computer games. Mino has to learn to make the best of it but his exuberant character turns every episode into an extraordinary escapade.” That’s the official description from Gaumont Animation in France, and you can see more at their web site. Currently they’re seeking distribution for Bric-A-Broc outside of Europe. The Ollie & Moon Show is a new 2D animated TV series, based on a popular children’s book series by Diane Kredensor, “…an Emmy Award-winning artist, director and producer whose credits include Pinky and the Brain and Clifford the Big Red Dog, among others.” [So says Variety]. 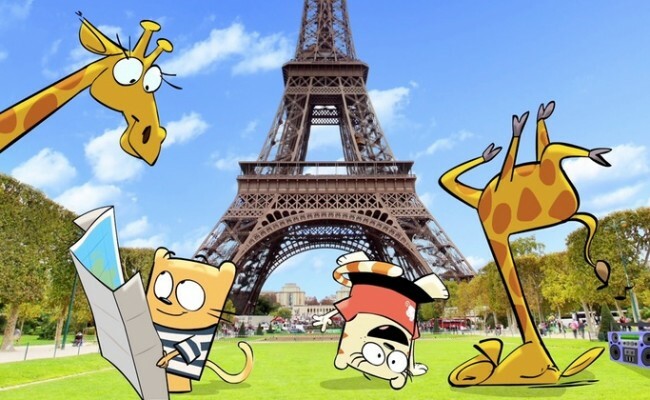 “In the series, two animated cats travel around the world. 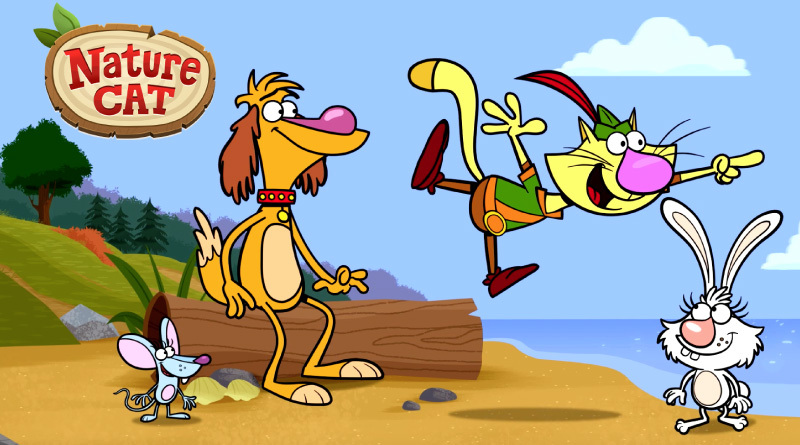 teaching viewers about the joy of unlikely friendships and global citizenship… The series will use art that blends live-action with 2D designs.” Ollie is a young cat who likes to plan and schedule his far-flung trips around the world. Moon… likes to bounce off the walls. Somehow these two get along well enough to travel together and learn as they do. The series has been picked up by NBC’s Sprout Network for broadcast starting in 2017. Another discovery from MIPCOM, thanks to Animation World Network. 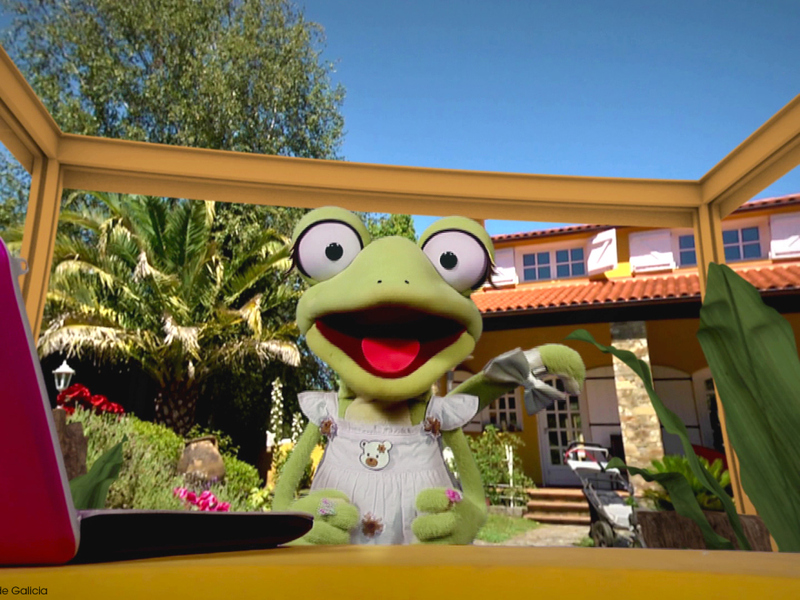 Created by BRB Internacional, Minchi’s Adventures combines puppetry, live action footage, and animation in each 3-minute episode. “The series follows a pet lizard belonging to a 7-year-old boy that, connected to the outside world via Internet, explains nature in a simple and very fun-filled way while encouraging ecological values.” You can learn more about it at BRB’s official Minchi page. 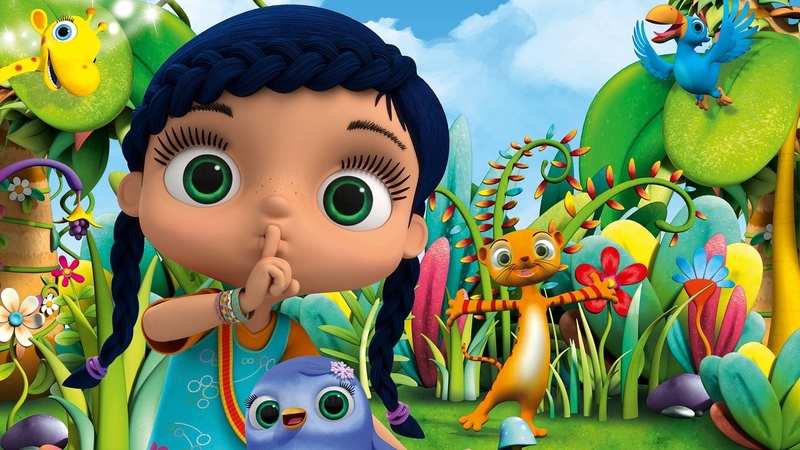 DHX Media (the production home of My Little Pony: Friendship Is Magic, Littlest Pet Shop, and many many more) have recently signed an international distribution deal for a new CGI TV series called Endangered Species. Unfortunately, so far none of those distribution deals include the USA! 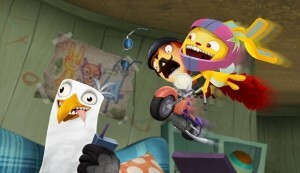 “The series follows Pickle, Merl and Gull, a bunny, a squirrel and a seagull who might not seem high on the protected species list, but who are constantly on the verge of catastrophic extinction through comical misadventure.” Check out the article over at Animation World Network to find out more. 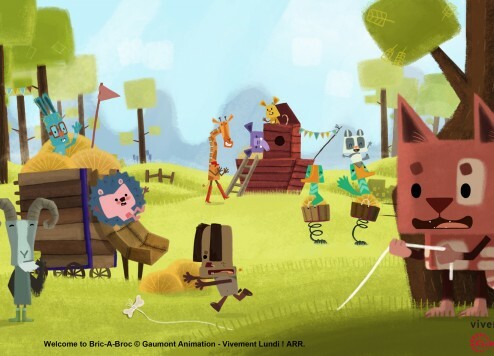 Animation World Network has a recent article about two more new animated shows that were presented at MIPCON this year — both of them produced by m4e in Germany. Wissper is “… a CGI animated TV-series aimed at young girls ages 4 to 7. 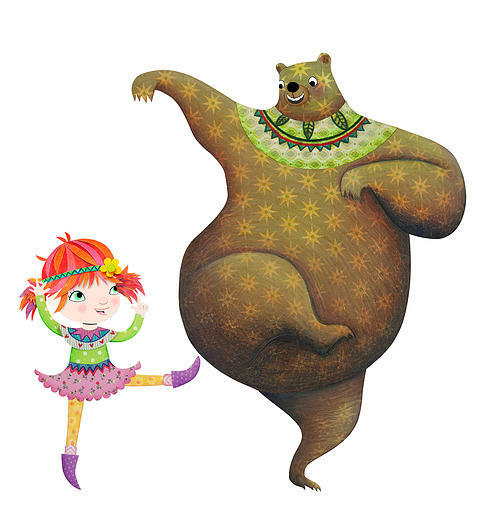 Wissper is a perfectly normal little girl, but she has a very special talent: She is the only girl in the world who can talk to animals! Creatures of all shapes and sizes seem to instinctively know that when they have a problem, Wissper will find the solution. This makes Wissper’s house the first port of call for animals in distress.” The first set of episodes are supposed to premier world-wide before the end of December. And then, there’s Atchoo! Another animated series, this time targeted at slightly older boys and girls. You see, there’s this young boy named Teo, with an unusual attribute: When he gets excited or upset, he sneezes… and instantly turns into an animal. Different each time. “The series offers loads of comedy, gags and funny dialogues, but all the fun is aimed at communicating an important message, that difficulties, fears and diversity are not necessarily all bad, but can engender endurance and originality.” That’s what they said folks! Atchoo! is scheduled to hit the world in 2017. Recently (October) it was once again time for MIPCOM in France, where dozens of TV production companies seek out international distribution for their new shows. Including lots of animated TV series — including several of furry interest. Among them is Deer Little Forest, which is actually part of a large international marketing campaign aimed at very young kids. (Check out their web site to see what we mean.) Among the many places you’ll find Deer Little Forest is an animated TV series created by King Rollo Films. “Deer Little Forest is a preschool brand created by Henries’ Award-nominated illustrator Jo Rose, currently being developed for licensing, publishing and television. The world of Deer Little Forest stars the irrepressibly enthusiastic Flo and her band of charming, silly, helpful and wise woodland buddies: Bodhi Bear (never shy to lend a helping paw), Rowan the Philosophical Fox (yogi and Japanese gardener), Barley-Crumb Badger (usually unearthing an interesting factoid under a rock), Lockhart Deer (relentlessly toot-tooting his horn and crashing about in glee), and local boy best friend Toby (the city slicker charmer).” You can see a preview of the TV series over on Vimeo. Turns out there’s also a Deer Little Forest app available.